The world isn’t always geared towards mums with babies in prams and so quite often I find myself in situations where I am really grateful for the kindnesses strangers. If you want to see the true colour of someone’s heart, walk around with a pram all day and see who helps you.There are two types of people in the world, people who see a woman approaching with a pram and wait to hold the door and the people who stand right by the door pretending not to see that she could use help. See how many people open doors for you or help you to get the pram on the bus. See how many people smile at you when you’re breastfeeding or give you that reassuring look when your baby is having a meltdown. I think that I have a lot of faith in humanity and try to see the positives in people not the negatives, but even I am constantly amazed by the kindness of people. There really are a whole load of good people out there who are only too happy to help a stranger that is struggling. So this is a thank you to the woman who helped me get the pram on the bus today when my wheel was stuck, thank you to the man who picked up my change for me in Sainsburys when I dropped it and couldn’t easily get it with Darcie in the baby carrier, thank you to the waitress who brought my Costa to me while I was feeding Darcie and thank you to the countless number of people that have held doors open for me over the last ten months or who have run after me to return a lost shoe or toy. These people and these small actions make such a difference to my day and they remind me to do the same for people that I meet who need a hand reaching for something on the shelf of the supermarket or who could do with the door being held open for them. 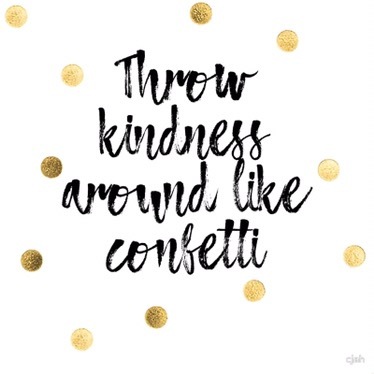 Kindness encourages kindness and we could all do with a reminder to spread it sometimes. "International Women’s Day// The Things I Want to Teach My Daughter"
"The Pressure to be a Pinterest Perfect Parent"